On the 24th of November, the Casimir Pulaski Foundation, together with the European Academy of Diplomacy, had the honor of organizing the Inauguration ceremony of the Academy of Young Diplomats 9th Edition and the presentation of the “Knight of Freedom” Award. The main events of the evening were the Inauguration of the 9th edition of the Academy of Young Diplomats and the Graduation of students from the 8th edition of the program. Maciej Wierzyński introduced Jan Karski, the patron of the 9th edition, in a speech extolling hos character and deeds. 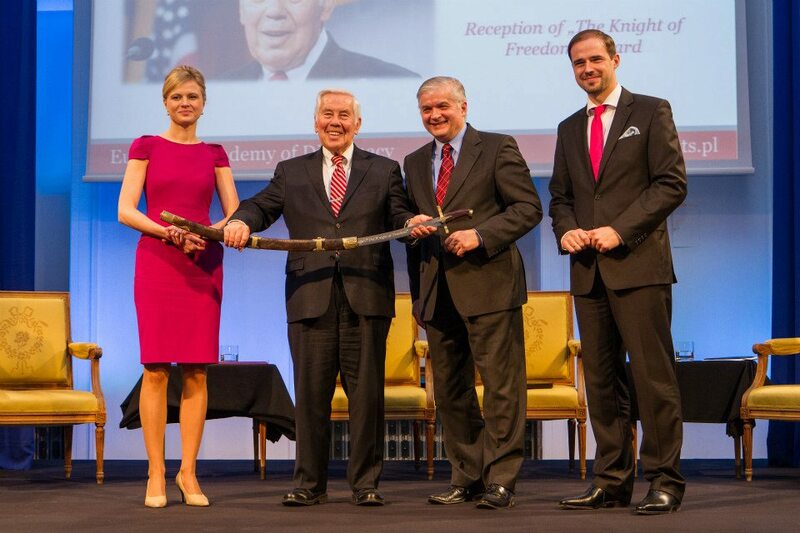 During the ceremony, the “Knight of Freedom” Award was presented to the U.S. Senator Richard Lugar for his engagement in advocating for Poland’s accession to NATO. Maciej Wierzyński, journalist from TVN24. The ceremony was followed by a panel discussion titled: „Towards a New Strategic Narrative: The Polish-American Alliance in Times of Pivot”. Richard Lugar, United States Senator, Victor Ashe, former Ambassador of the United States of America to Poland, Andrzej Olechowski, former Minister of Foreign Affairs of Poland, Witold Waszczykowski, Vice-Chair of Foreign Affairs Committee of Sejm of the Republic of Poland all participated in the panel discussion, which was moderated by Andrzej Klesyk, CEO, PZU Group.